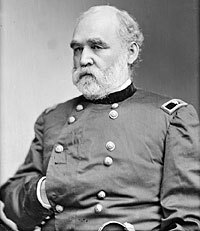 Union Quartermaster General Montgomery Meigs was appointed to his post in May 1861. 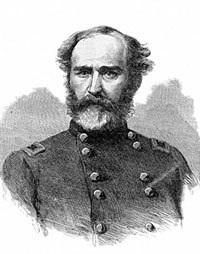 Meigs headed the army expedition to Fort Pickens, Florida in 1861. 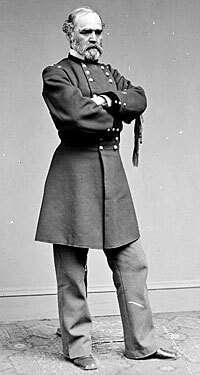 He frequently conferred with President Lincoln about military affairs and military weapons, beginning with the expedition to relieve Fort Sumter and Fort Pickens in 1861. 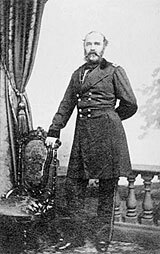 Meigs was dismissed from this engineering duties by Secretary of War Floyd in 1859 and reassigned to the Dry Tortuguas. His familiarity with Florida led to his involvement by Secretary of State Seward in a plan to keep control of Fort Pickens. In the Pickens-Sumter affair, Meigs took on an extraordinary role, according to James G. Randall: “It was Meigs whom Seward used, in a secret and underhand manner, to promote the Pickens expedition, which was in a peculiar sense Seward’s own scheme. Working with [Secretary of State Seward], Meigs on April 1 was busy all day making orders for the signature of the President. 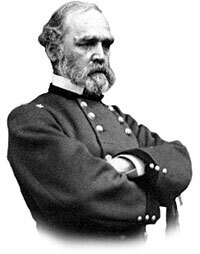 He related that he was being asked to assume command far beyond the level of his captain’s rank.” In effect, Meigs help shift the warship Powhatan from the relief of Fort Sumter to the relief of Fort Pickens, undermining the intent of orders of President Lincoln and bypassing Secretary of the Navy Gideon Welles.1 Meigs went with the rescue fleet to Florida and then reported on the mission to President Lincoln on May 3, 1861. 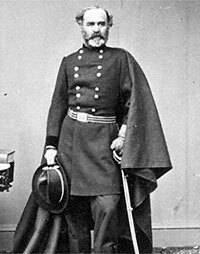 In September 1861, Meigs also served with Postmaster General Montgomery Blair as the President’s emissary to check on General John Frémont in Missouri. The council was called. On Sunday, January 12, McDowell and Franklin called on me with a summons to the White House for 1:00 P.M. These officers, and messrs. Seward, Chase, Blair, of the Cabinet, attended. 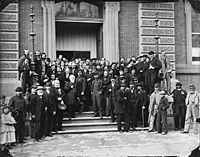 The President announced that he had called this meeting in consequence of the sickness of General McClellan, but he had that morning heard from him that he was better, and would able to be present the next day; and that, on this promise, he adjourned the discussion for twenty-four hours. 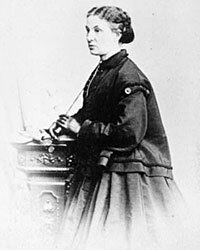 The next day, January 13, the same persons and General McClellan appeared at the rendezvous. The President opened the proceedings by making a statement of the cause of his calling the council. Mr. Chase and Mr. Blair, if memory is accurate, both spoke. All looked to McClellan, who sat still with his head hanging down, and mute. The situation grew awkward. The President spoke again a few words. 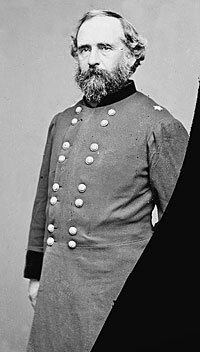 One of the generals said something; McClellan said something which evidently did not please the speaker and again was mute. 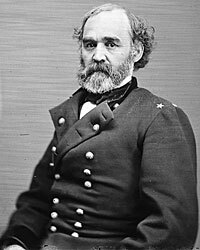 Meigs helped to stem the panic in Washington two years later when in July 1864 the city was threatened by Jubal Early’s Confederate forces and he organized War Department personnel as a defense force. 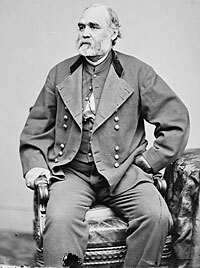 That October, Meigs’ son John Rodgers Meigs was shot and killed in the Shenandoah Valley in an incident that his father regarded as murder. James G. Randall, Lincoln the President, Springfield to Gettysburg, Volume I, p. 358. Geoffrey Perret, Lincoln’s War: The Untold Story of America’s Greatest President as Commander in Chief, p. 51. Roy M. Basler, Collected Works of Abraham Lincoln, Volume VI, p. 450. Stephen B. Oates, With Malice Toward None: A Life of Abraham Lincoln, pp. 284-285. Michael Burlingame and John R. Turner Ettlinger, editors, Inside Lincoln’s White House: The Complete Civil War Diary of John Hay, p. 191. James M. McPherson, Tried by War: Abraham Lincoln as Commander in Chief, p. 112. Frank Abial Flower, Edwin McMasters Stanton, p. 179. Michael Burlingame, Abraham Lincoln: A Life, Volume II, p. 220. Allen C. Guelzo, Fateful Lightning: A New History of the Civil War War & Reconstruction, p.316. Richard H. Luthin, The Real Abraham Lincoln, p. 653. Ernest B. Furgurson, Freedom Rising: Washington in the Civil War, p. 52.